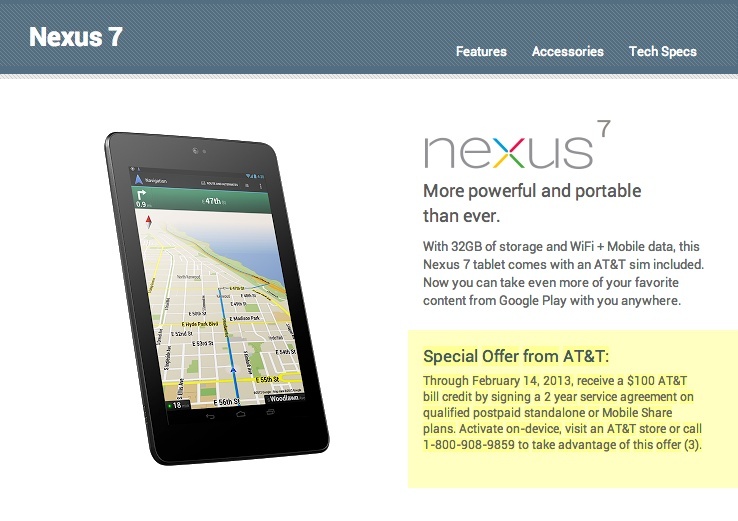 Yesterday afternoon, we were pinged to a change in the Nexus 7 HSPA+ listing on the Google Play store. That change was the inclusion of a new special offer from AT&T that Google was attempting to highlight. For those interested in adding on HSPA+ service to their newly purchased Nexus 7, AT&T is now willing to toss in $100 bill credit when you sign a 2-year service agreement. That’s certainly kind of them, but probably isn’t a big enough credit for you to run out today and buy the HPSA+ N7 just to get credit back. Remember, that once you sign up for two years, you are stuck for two years.